Every company touts their artificial grass product as durable and high quality. Yet how can you make those claims without proof? Testing artificial grass would be a great way to validate a product, but how would you do that? The annual Dreamforce conference by Salesforce. That's how. Read on for more information. When we say our products are durable we mean it. The annual Dreamforce conference is a huge event. It gets larger every year. In 2003, the first conference had 1,300 attendees. This year there were over 170,000 attendees. That is impressive growth. 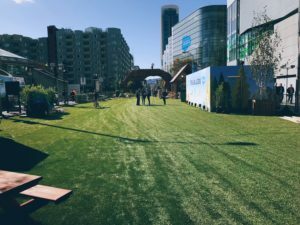 So when a large production company reached out to Artificial Grass Pros for help with installation for the Dreamforce 2017 conference, we were thrilled to be chosen again. 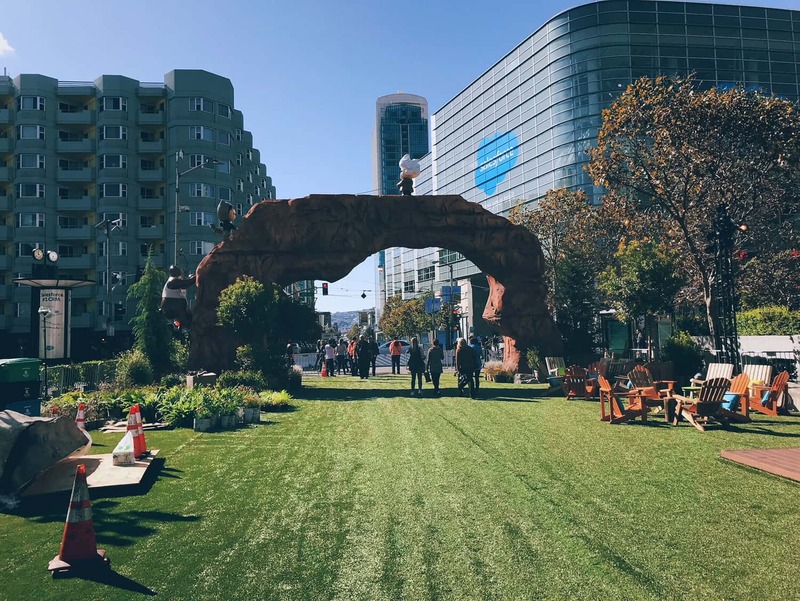 This would be our 6th year in a row helping with the Dreamforce event, testing artificial grass to its limits! And while we knew the event grows larger each year, 170,000 people, wow. We knew the install would need to be a product that could take a beating and still look great. This year the conference was held November 6th-9th. During this three day event, the attendees will have access to one of 3,200 sessions. That's a lot of information to help people achieve their sales goals. For us, it's a lot of feet trampling back and forth from one work shop to another. So what does installing a green space for 170k people involve? Besides testing artificial grass in regards to durability, it involves a few things… time, attention and efficiency. Since this was not a typical artificial grass installation, the process was modified. However, that does not mean it was quick. Installing turf for the conference took 4 days. The first two days we prep the space for artificial grass application. This means navigating challenges like permanent fixtures, or obstacles we can remove temporarily, then prepping the surface for install. Before Dreamforce: All of the streets are full of traffic. 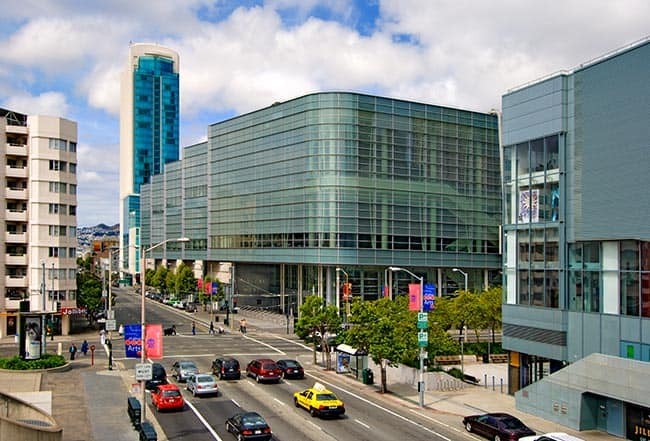 The “surface” we are talking about are the streets alongside the Moscone Convention Center. Take a look at the before picture. Those asphalt streets turn into beautiful green spaces for the duration of the 3 day Dreamforce convention. This is no small feat. It involves 72,000 square feet of artificial grass. Time is always our largest obstacle with these types of installs. Streets are only blocked off for a certain period of time so it is imperative that we are ready to move when the green light is given for us to begin work. After prepping the streets, the last two days are spent laying down the artificial grass. This year's install we used NewGrass Premium Natural for the project. 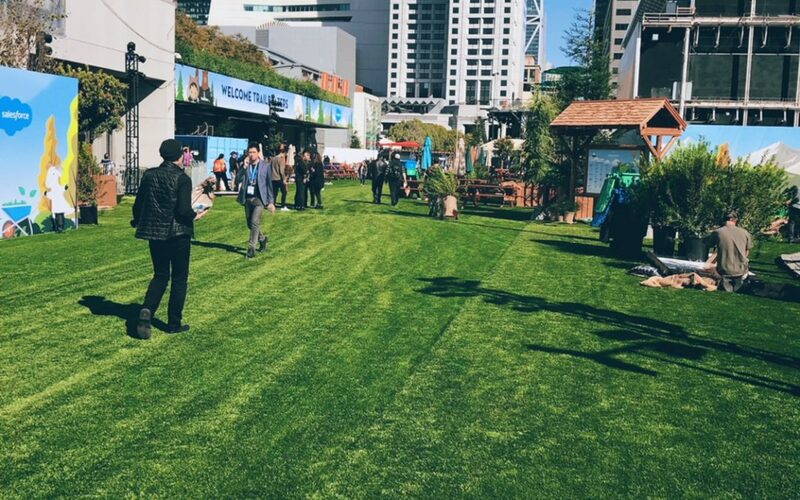 After Dreamforce: 72,000 sf of artificial grass transforms the streets into an eco-conscious conference venue,. Premium Natural holds up really well to foot traffic. It uses varied textures, materials and heights to create a product that looks like real grass. Plus, it is one of the greenest ways to promote San Francisco. Already known for being eco-conscious, using artificial grass to temporarily transform a space makes the most sense. It is another way we contribute to the health and well being of everyone living in the Greater Bay Area. We love the city. This install is more than just a Dreamforce project. It is a way to promote all the Bay Area has to offer in the way of business and trade. It keeps our carbon footprint in check and our waterways free from toxic runoff. Yet, Dreamforce does so much more. The event fosters creativity. It gives ideas to others in attendance who own their own businesses. After seeing the asphalt streets space transformed into lush grassy areas, it puts ideas in their head too. Any space can be transformed with artificial grass. It is a very eco-conscious manner. Should they need assistance, we are ready. We have worked with GoDaddy and Google, so we know what larger companies are looking for in an install. Since we own our own artificial grass company, we can even help with the selection process. The Dreamforce install is proof that having a one stop shop makes things so much easier. During conference time, event planners know one phone call to AGP is all it takes. We handle the project. There is no need to call a separate company for product. We can handle both. After the conference, removal is necessary It only takes two days for us to return the space to how it originally looked. Still, people love how it feels to walk on green spaces that are usually roads. Those familiar with the area always remark at how inviting the space feels. The artificial grass works together with other conference elements to really brighten the space and foster a creative atmosphere. It's always a sad day when we have to remove the turf. It's like taking the magic back. However, the attendees can take comfort in the fact that we will be back for the next one. Dreamforce and Artificial Grass Pros are a beautiful combination. We are thrilled every year we are asked to return and install another space for the three day event. Long term relationships are great. You get a chance to grow with the client. As their needs and demands increase, so will the need for your products and services. That's how we feel about it anyway. We anticipate next year to be larger and possibly longer. It's amazing how they cram so much information and actionable events into a three day training. They may need to tack on an extra day if growth continues at this rate. Whatever the case, we stand ready to meet the the challenge. Artificial Grass Pros can transform your space. We have been testing artificial grass for years and have the happy customer testimonials to prove it. Give us a call and let's get your project started. If we can handle Dreamforce and 170,000 people, we can certainly meet your needs. Our specialists are ready to speak with you and make your dreams a reality. My name is Kelby Smith and I’m on the Global Communications team at Old Navy HQ. I’m putting on an event on May 17th and am thinking about getting a portion of our courtyard covered in green/grass-like carpeting. The theme is Americana and so I want it to have a “backyard BBQ” type feel, on a recently very cut budget. I’m interested in learning more about timeline and costs.